Update: (06/10/2011): The video of Neil's solo performance on the Late Show with David Letterman is now online (view below). Bubba's in NYC to do the Letterman taping today. Show airs on Thursday.. Thanks to Ed from RushIsABand for the heads' up on the tweet. 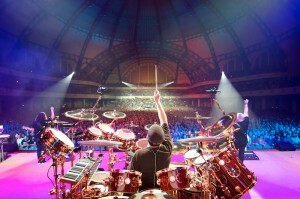 Update: (06/03/2011): According to a post from Rush's official Facebook page, which linked to this article, not only will Neil be performing on the David Lettermen show, he will be performing "the grand finale to a 'drum solo week'"
"...the finale drum solo performance of the week on Thursday, June 9 goes to Neil Peart, drummer for the legendary rock band Rush and regarded as one of the greatest drum soloists in rock music..."
According to the latest issue of Entertainment Weekly, Neil Peart is scheduled to make an appearance on the David Letterman show this June 9th as part of the Drum Solo Week . Click HERE to view a scan of EW issue mentioning Neil's appearance. June 9th does fall on a day off for the band (between the Greenville, SC and New Orleans, LA shows) however it is unknown at this time whether the appearance will be live or pre-taped. That would be incredibly rare! Neil almost never comments publicly! I met Neil in Fukuoka Japan during P/G Tour. He is a great person, and a super Drummer. I seriously hope this isn't a hoax like the Olympics openings. Is there a deleted expletive which covers DirectTV having an outage during the recording of this show? Found it on YouTube, but only in lowly 720p. Oh, well. Better than nothing! Great solo as usual for Mr Peart. I was especially moved by the crowds reaction.